Our favorite bacon smothered in Jalapenos. What a way to wake up your taste buds! 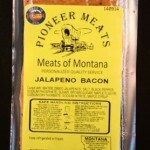 For the bacon connoisseur in all of us found at Pioneer Meats in Big Timber, Montana.